Washington has played the role of instigator throughout the entire Ukrainian conflict, said Russia’s envoy to the UN, Vitaly Churkin. He added that Kiev authorities have not taken any steps to start dialogue with the militia in eastern Ukraine. “The current military escalation has miraculously coincided with the visit of US Army Europe chief [Lt. General Frederick Ben Hodges] to Kiev,” he added. Hodges held a press conference in Kiev on Wednesday, during which he said that the US is planning to expand military cooperation with Ukraine. “Wherever Washington is turning its eyes – Iraq, Libya, Syria, Ukraine – there is destabilization, crisis, blood,” the Churkin said. The Russian diplomat responded to the speech of Ukraine’s UN envoy, Yury Sergeev, who accused Moscow of aggression towards Ukraine. “During our multiple Security Council discussions, the Ukrainian delegation hasn’t said...a non-offensive word about the population of the south-east of the country [Ukraine],” he said, adding that Kiev officials call them “bandits” and “terrorists.” Churkin stressed that “only inclusive political dialogue” can solve the crisis in the country. According to the Ukrainian envoy, the recent Kiev mobilization is a move to protect the country from rebels in eastern regions. Sergeyev claimed that Ukraine stands for a “peaceful solution of the crisis based on Minsk agreements and respect of territorial integrity, sovereignty and political unity of the country.” Kiev authorities “do everything possible to meet the needs of civilians in Donbass region,” which includes Lugansk and Donetsk regions, he said. Churkin also repelled claims by US envoy Samantha Power, who said that Russian President Vladimir Putin’s new peace proposal aimed at eliminating the conflict in eastern Ukraine is “an occupation plan”. 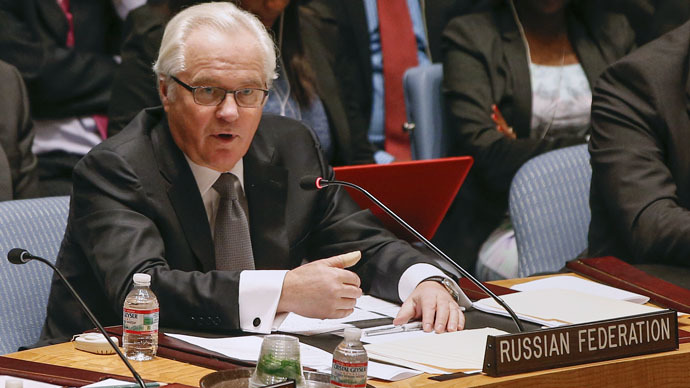 “The plan would seek to legitimize territorial gains made by separatists in September as well as Russian personnel and equipment on the territory of Ukraine,” Power told the UN Security Council. The Russian envoy, however, replied that Moscow was ensuring “full compliance with the Minsk agreement.” Kremlin has repeatedly called on all sides of the conflict sides respect the treaty. Russian Foreign Minister Sergey Lavrov pointed out on Wednesday that the freshly-made statement on the conflict was worked out by the foreign ministers of France, Germany, Ukraine and Russia, and is fully in line with the de-escalation plan that Putin proposed to Kiev. Russia’s UN envoy also highlighted the recent statement by Ukrainian PM Arseny Yatsenyuk about the “USSR invading Germany and Ukraine,” which caused quite a stir in Russia, as well as calls for European leaders to react. The Russian diplomat reminded that Kiev decided to celebrate October 14, which is the day of creation of Ukrainian Insurgent Army, as a national holiday. “There is glorification of Ukrainian Nazi collaborators [Stepan] Bandera and [Roman] Shukhevych who had the blood of tens of thousands Soviet and Polish civilians on their hands,” he said. Permanent Representative of Russia in UN Churkin: "To celebrate Bandera and Shukhevich would be like celebrating Ku-Klux-Klan in USA!" Earlier, Moscow had been puzzled by Polish Foreign Minister Grzegorz Schetyna, who stated it was the Ukrainians who liberated the Auschwitz-Birkenau concentration camp. He was answering a question related to invitations to join the ceremonies marking the 70th anniversary of the liberation of the German Nazi concentration camp by the Red Army on January 27, 1945. The Polish official seemingly confused the name given to the Soviet Army’s 1st Ukrainian Front with the soldiers’ ethnicity. Previously, the regiment had played a crucial role in liberating parts of modern Ukraine, Poland, the Czech Republic and Germany. It was called the Voronezh Front and earlier the Bryansk Front.